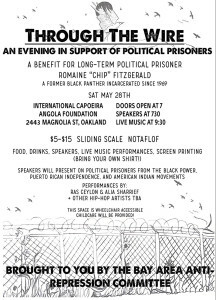 Join us on Saturday May 28th at 7pm at the International Capoeira Angola Foundation for an evening of food, speakers and music to support long term Political Prisoner, Romaine “Chip” Fitzgerald, and to build solidarity around US Political Prisoners. and the Political Prisoner Committee of the National Lawyers Guild. 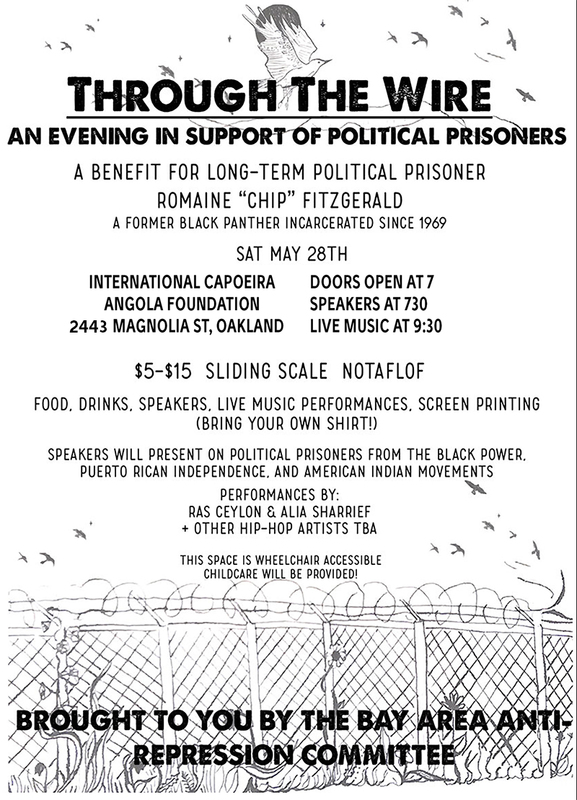 important as radicals and activists to support political prisoners. Live Music will start at 9:30. Ras Ceylon: emcee, educator and organizer bringing revolutionary music, a hip-hop meets reggae dynamic and explosively conscious lyrics. Alia Sharrief, a Muslimah in Hiphop demanding respect on the mic while combatting stereotypes through her music. Tongo Eisen-Martin: Poet, movement worker and educator who has organized against mass incarceration and extra-judicial killing of Black people throughout the United States. His latest book of poems is titled, “someone’s dead already” was nominated for a California Book Award. There will be food, drinks, and screenprinting (bring a t-shirt!). Childcare will also be provided.